The words “discipline” and “disciple” share the same Latin root word, discipulus, which translates roughly to student. To be disciplined means to be constantly learning, training, and self-correcting. Discipline is at the heart of character building, essential to the path of becoming a better, happier person. But cultivating self-discipline is a slow and sometimes painful process. If you struggle with bad habits and staying on task like I do, then I hope these four ideas will be a blessing to you. If you don’t have a good reason to do something, it probably won’t get done. Whatever you want in life requires focused work and emotional engagement. What I do every morning is spend some time in prayer with God. I ask Him to prepare my heart and my mind for the day and stay focused on what’s important. This helps me because I can engage emotionally with the coming day and think about how I want to feel that day—the energy that I want to experience and exude. It doesn’t have to be “prayer,” but it’s good to communicate your feelings and goals out loud (or on paper). Just try to carve out some “me time” at the beginning of every day so you can focus your mind on what you want to accomplish. This will help keep you disciplined and motivated. This may sound strange coming from me, but in order to remain disciplined and an effective servant of the Lord, it’s important to take care of yourself first. When we aren’t taking care of our physical, emotional, and spiritual lives, we tend to do more harm than good when trying to serve others. Don’t spend the majority of your day thinking about others. Spend more time focusing on your own self-development, constantly self-correcting and training, so that you can become a valuable servant for God. Ask yourself, “Is this going to help both me and those around me?” with each action and thought you have. I’ve talked about this before but it’s important to talk about it within the context of being more disciplined. Practice makes perfect, so if you are trying to learn a new language, skill, or habit, make sure you set aside time for it. For example, in order to accomplish my goal of getting more fit, I set aside an hour to exercise between when I leave work and when my kids get home. By setting times, calendar reminders, and writing down goals, I am able to make it a requirement of my daily routine. If you aren’t blocking off time and keeping track of your progress, you are making it very hard for yourself. Create a Pavlovian reward system for when you achieve a goal, no matter how small. Keep in mind that you don’t want to reward yourself with an unhealthy snack after eating a healthy meal or working out. Your reward should be healthy. Small victories celebrated well. You can also help cultivate discipline by creating a punishment system for when you stray from the path. For instance, some people wear a rubber band on their wrist so that they can give themselves a little snap whenever they catch themselves doing something they want to stop like biting fingernails or turning on the TV. Walk straight and don’t stray off the path. (4) Build reward systems into the process. 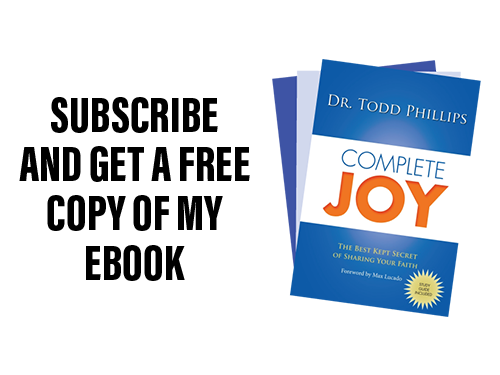 Hey this is Todd Phillips, your online pastor and personal life coach. And I’m talking today about How to Become More Disciplined. Now this is a big issue for a lot of people including myself and I just want to say this upfront. The things that I’m talking about today are things I’m working on in my own life. I certainly haven’t arrived in this, but I’m seeing progress. So I was encouraged enough to be able to share this with you today and I hope it will be a blessing to you. So the number one way to be more disciplined—and I couldn’t think of a better way to put it other than this—to emotionally engage with our dreams and our goals each day. One of the biggest challenges I think as we walk through life is just getting up, showering, getting ready for the day, and then all of a sudden from point one of the day, we’re at a hundred miles an hour and we never slow down enough to reflect on the realities of why we’re doing what we’re doing. One of the things that I’ve started doing each morning as I wake up, now as a Christ-follower, this includes prayer, but you can apply this whether or not you believe in God, but I’ll tell you what I do. I get up every morning and I spend some time in prayer with God. I ask him to prepare me for the day, to prepare my heart and my mind for the day—for the things He’ll have in front of me. Not just the things I have on my schedule, but those, what I call “ministries of interruption,” those things that you don’t plan on happening but I pray that God would give me the discernment to know when to lean into those situations. And another thing that I do when I’m in prayer though, is I ask God to just allow me to get emotionally engaged with my goals. You know one of the big things I’m doing right now is trying to get more physically in shape. I went through some challenging months where I was doing a lot of traveling and I just wasn’t working out. And so I’m getting back into that process. So in my morning time with God, I pray that God would set up my schedule to allow me to structure my schedule to engage in that working out. Because I know that when I eat right and when I exercise, I feel phenomenal, I just feel fantastic. And when I don’t exercise and I don’t eat right I feel absolutely horrible. And of the two, I’ll take feeling phenomenal any day. You with me? So I get emotionally engaged in that I think about how I want to feel that day—the energy that I want to experience because I eat right and I exercise. And so I get emotionally engaged with those dreams and those goals, whether they’re smaller dreams and goals like working out each day, or a bigger dream or goal that we might have about getting promoted at work. Whatever it might be, just emotionally engage and think and reflect on those things before the day starts. The second thing to become more disciplined is to do our work, right, our responsibilities before responding to the needs of the world. Now, that may sound very ironic coming from me. But I to put this in perspective. We need to care for others but if we don’t have our own house in order, if we don’t have our own lives in order, it becomes very difficult to help anyone else that’s in need. We’ve got to have our family lives in order, our work lives in order, our spiritual lives in order, our physical lives in order, so we can then help others, serve others, lean into others’ challenges. We’ve got to do our work before we can respond to the needs of other people. That helps us to become more disciplined. We ask ourselves, “Is this going to help both us and those around us?” with each action we take and each word that we speak. Number three and I’ve talked about this before but it’s important to talk about it within the context of being more disciplined—it’s simply to block off our time. When I work out every day now, instead of going in at eight o’clock in the morning at my job, I have the freedom to come in early and leave slightly earlier. So instead of working from 8:00 to 5:00 or 8:00 to 5:30, I work from 7:00 or 6:30 in the morning until about 4:00 or 4:30. And that way, I’ve blocked time for my exercise from 4:00 to about five o’clock and I can be home in time for dinner when the kids get back and we can all sit down as a family and eat. I’m blocking that time off, I’m scheduling it, I’m writing it down each day so that it’s a requirement of my daily routine. One of the biggest things we can do is block off those times in advance of the action. So just like we would make a meeting or a phone call at our job site, just like we would have meetings where we meet with other at our job site, we schedule, we block off time for the things that are important to us. That allows us to be more disciplined. Our schedule guides us through the day in a very positive way. And the fourth and final thing to become more disciplined is to build in a reward system. This is one of the things that I don’t know why I didn’t figure this out early on, but it took me years to figure this out. Even small victories, listen even small victories are worth celebrating. I think we fail to celebrate our victories each day, whether it’s working out or getting a promotion, or if we decide we’re going to read the Bible every day and we get through the first seven days of reading every single day in the Bible. That may sound small to you when you listen to it from me, but for someone who’s got a goal of reading the Bible each day, that could be a huge thing for them. It’s a small victory celebrated well. Let me say that again—it’s a small victory celebrated well. We’ve got to build reward systems into our discipline so we can celebrate when things go well. Now, there are some things I’ve heard people do and I’ve done this in my own life that I kind of want to warn you against. Sometimes people when they’re working out, trying to get physically healthy and they’re trying to eat right, they’ll have a reward system set up where they eat right for six days and then they have this terrible day where they can eat anything they want. And the problem is and we all know this right, we can destroy six days of eating well by one really, really bad day of eating rotten. And so what we’ve got to be careful of, when we set up our reward systems there needs to be boundaries around them. And also, a reward system needs to push us toward our goals not away from them. (4) We need to build reward systems into the process. Small victories celebrated well. Until we see each other again, LIVE PASSIONATELY, GIVE GENEROUSLY, and IMPACT THE WORLD FOR GOD. This entry was posted in Blog, Personal Development, Videos and tagged Christian, Christianity, discipline, habits, learning, Life Coach, Monday Devotional, motivation, Online Pastor, personal development, self development, self help, strength, teaching, Todd Phillips, training. Bookmark the permalink.